With thanks to Marianne Mueller for permission to use these two pics, which she shows at Hacker Barbe Dream Basement. Put up in 1995, most of that site's links are now dead, probably courtesy of Mattel's publicity people. But these images of the genuine, unmodified historic dolls have survived. 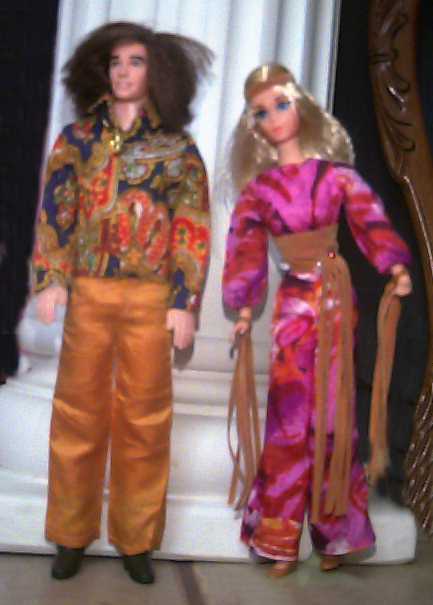 Then scroll down for Wingo Wong's Dragon Tattoo Barbie. 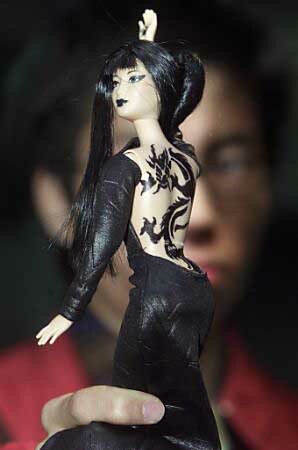 Wingo Wong, a design student from the Hong Kong Polytechnic University, displays a Barbie doll with a dragon tattoo running down her entire back, November 16, 2001. In an experiment by dollmaker Mattel to test local creativity, 20 design students in Hong Kong were given two days to dress up the venerable doll.